Your boiler keeps you and your family warm and ensures that you have central heating and boiling hot water as soon as you need it. But, like all the complex equipment in your home, it needs regular maintenance and looking after to ensure that it is working well. The pressure in your boiler works to heat the cold water that flows around the pipes and radiators in your home. For it to work as efficiently as possible, your water pressure needs to remain at a constant level. If the pressure levels become too low or too high, your boiler could fail. Modern boilers have in-built pressure gauges that are easy to access should your boiler start to lose efficiency. Just by looking at the gauge, you should be able to see if the pressure is too high or too low to effectively control the flow of water around the heating system. 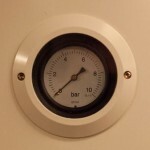 This gauge could be in the form of a traditional dial, or a more modern digital display. When your boiler pressure gauge reads less than 1 bar, you may have lost water somewhere in the system that will need to be replaced. If, however, the boiler indicates a pressure reading of 2.75 bar or higher, the pressure relief valve will start to discharge water to outside. Bleeding your radiators can help to reduce the pressure until the pressure reading is back to norm. You should call in an experienced central heating engineer if your boiler pressure is too high and bleeding your radiators doesn’t rectify the issue. Modern day boilers have either an in-built or external filling loop fitted. The filling loop is used to re-fill (and therefore re-pressurise) your central heating system with water when needed. While filling loops may vary in design, there is a standard re-pressuring process that you will need to undertake to get your boiler working well again. Switch the boiler back on and press the reset button if your digital display calls for it. Although the above is a basic guide to re-pressurising your boiler, you should always carefully read through the manufacturer’s instruction manual before making any attempt to change the pressure levels on your boiler. Every manufacturer varies the design of their units slightly, and you want to ensure that you don’t make the problem worse or damage the boiler in any way. Our experienced and highly professional boiler engineers can help get your boiler working perfectly again. We can attend and service your boiler in Bristol if you do not feel confident enough to do so yourself, or if the bar level is high. Call DHS today on 0117 924 7200, email us or request a call back.